With a high-frequency "flying" oscillator. 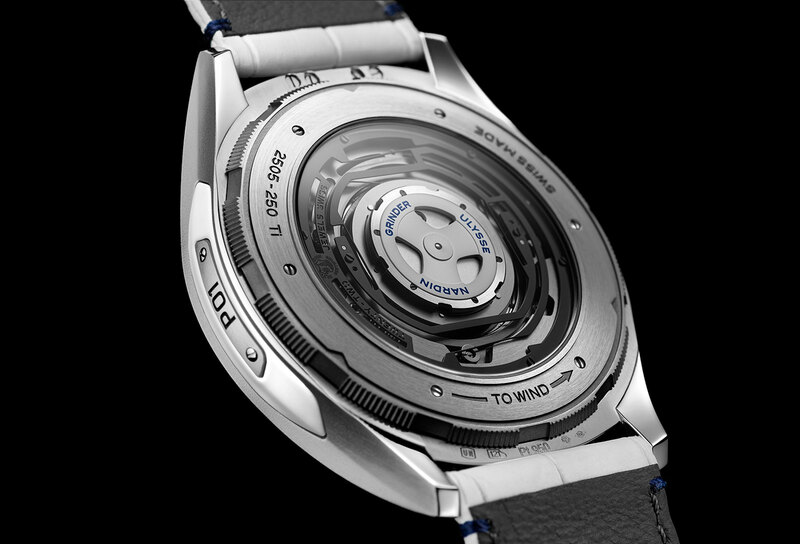 Just months after Ulysse Nardin launched the entry-level “Freak-lite” at SIHH 2019, it has returned to the other extreme of watchmaking, providing a glimpse into its vision of watchmaking’s future with the intriguing Freak neXt concept watch. It’s essentially a followup to last year’s Freak Vision, the cutting edge flagship watch of the Freak range. Made entirely of silicon, the neXt oscillator is “floats”, meaning it has no balance staff, and vibrates at high frequency. It’s made up of four stacked silicon wheels, each fitted with eight “micro-blades”. Each pair of blades form a triangle, so each wheel has four triangles within. 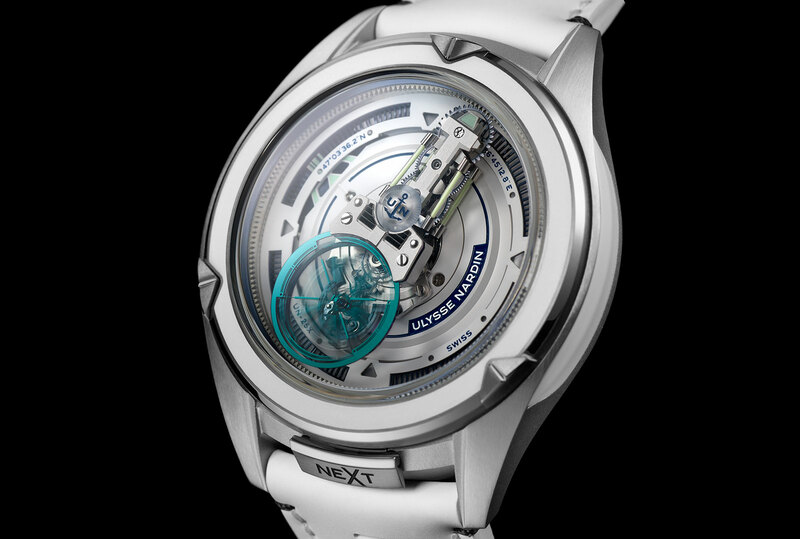 Each vibrates on the same central axis, or a “virtual pivot point” according to Ulysse Nardin. Their operation relies on the elasticity of silicon, meaning the blades flex and release with constant energy each time. And because silicon is lightweight and operates with zero friction (remember, no pivots), the neXt oscillator is highly efficient. Not only is the oscillator silicon, but so are all the wheels of the going train. 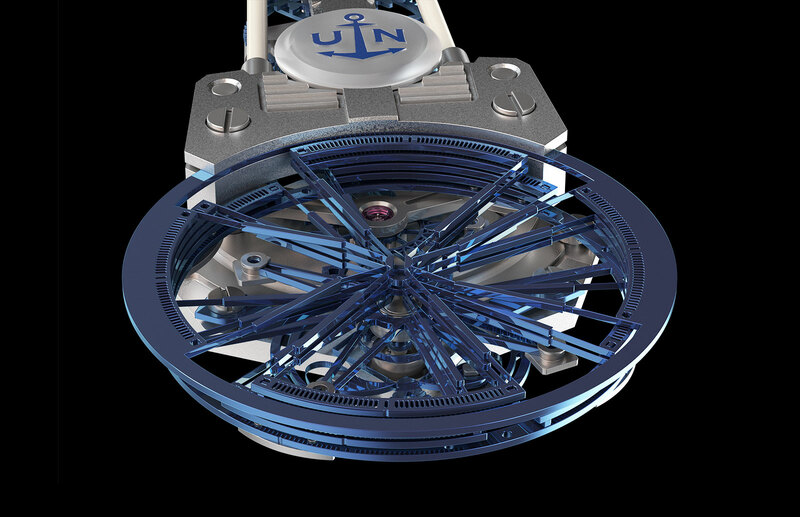 Also made entirely of silicon, the Ulysse Anchor Escapement also relies on the elasticity of silicon to operate as a constant force escapement. The neXt oscillator runs at 12Hz, or 86,400 beats per hour, three times the frequency of a conventional balance wheel. The watch nonetheless has a 70 hour power reserve, a 30% increase over the preceding Freak model, due to the extreme energy efficiency of the oscillator, wheel train and escapement. This video illustrates the neXt oscillator in action. 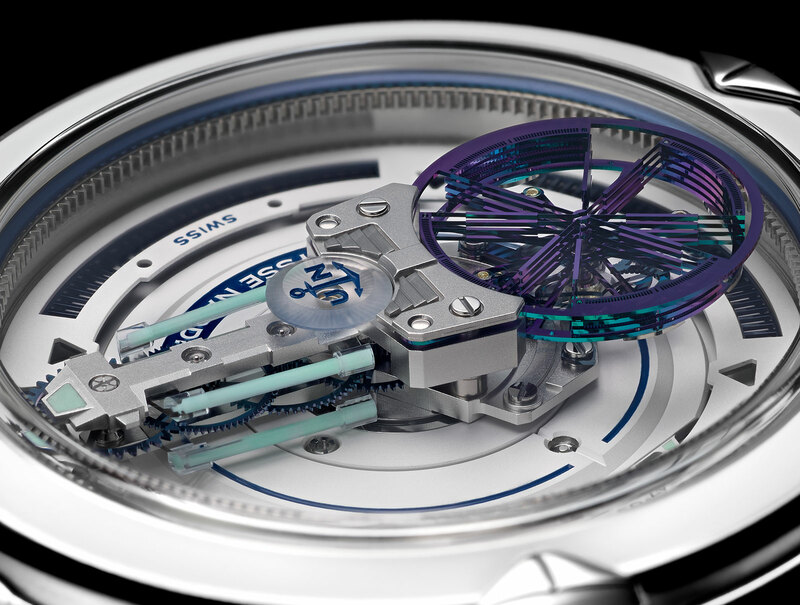 The third notable feature in the Freak neXt is the Grinder automatic winding system that uses a rotor connected to an outer frame with four winding clicks, increasing the efficiency of winding. Unlike earlier Freak models that were clad in dark colours, the neXt is mostly white, accented with Super-Luminova on the bezel and also the baguette-shaped movement that forms the minute hand. The case is 45mm, and a mix of titanium and platinum. 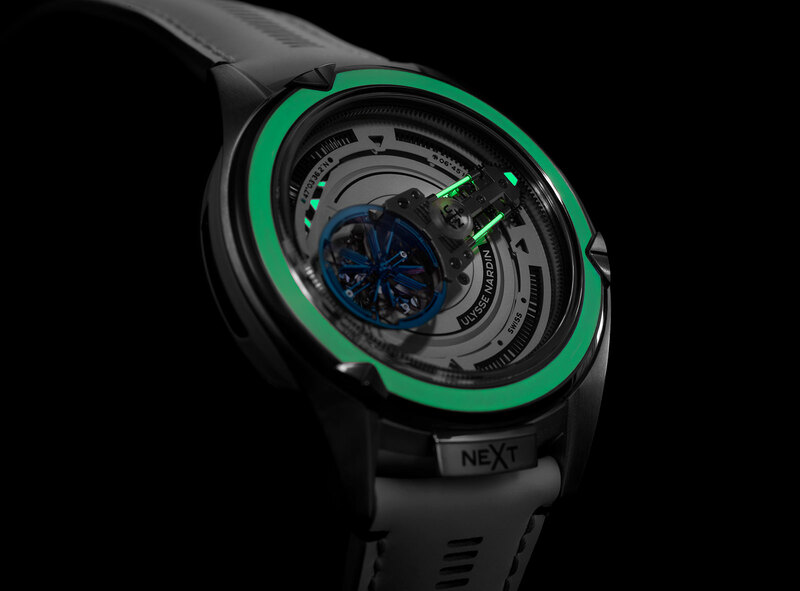 The Freak neXt is a concept watch but expect its to make their way into production watches very soon. 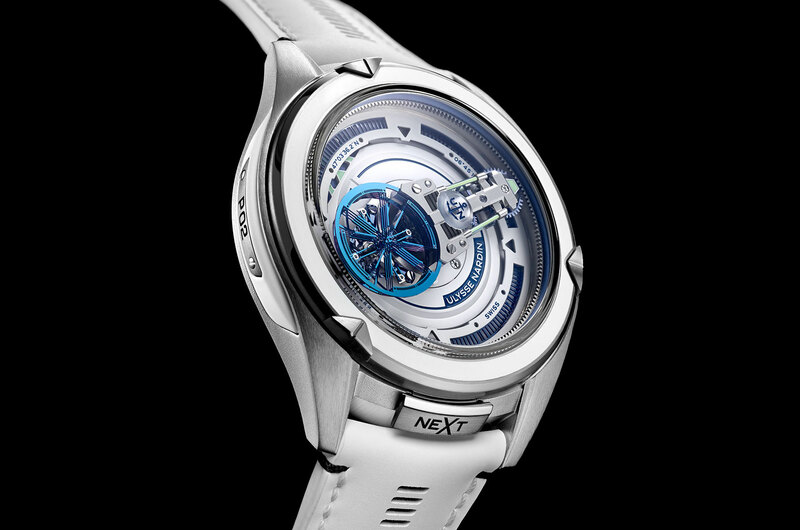 The Freak Innovation concept watch of 2017 took only a year to evolve into a production watch, so expect the same for the Freak neXt. The Innovision reaches the consumers' wrist, for the most part. A dial of silicon mosaic.